Hernon Dripstop 950 is a pipe joint & thread sealant that is highly recommended where oxygen, aggressive chemicals, such as chlorine or powerful oxidisers, are present. It is a high density inert thread sealant and lubricant, specially formulated for severe high pressure applications. Oxygen system pipe sealant 950 is odoorless, non corrosive and hydrophobic. It is totally non migrating and remains where it is applied. It is ideal for use in repetitive assembly and where disassembly is required, even after long periods of time. It can seal up to 10,000 psi on ¼” NPT threads. Non flammable, chemically inert, non toxic, stable to 450ºF, will not burn, will not melt, non migrating, lasts indefinitely, excellent anti-seize properties, high dielectric strength, high density, non corrosive, odorless, lasts indefinitely, has high dielectric strength, contains no silicone or hydrocarbons, low turning torque, easily sheared. 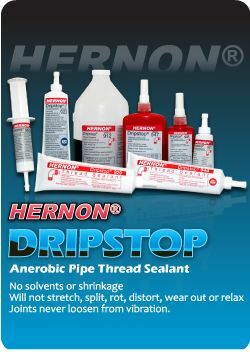 Hernon’s family of Dripstop sealants are engineered to provide many distinct advantages over conventional pipe dopes for plumbing, refrigeration and hydraulic applications. Anaerobic pipe sealants and adhesives are superior to other sealing methods in that they contain no solvents and they do not shrink, stretch, split, rot, distort, wear out or relax over time and joints never loosen from vibration. Dripstop sealants harden without shrinkage in the joints and create a tough, insoluble, vibration proof seal that will not leak even if the threads are damaged. Dripstop products do not shred like tape dope and they are not subject to cold flow, pressure or temperature phenomena like non-hardening dopes. Central Tapes & Adhesives Ltd are the UK & European technical specialists for Hernon Manufacturing Inc. For more information please contact us. Hernon, Hernon engineering, Hernon oil and gas. permalink.